Snippets but no links. Like right wing radio. Speaking of radio, I requested a HOT song on Radio New York International on WBCQ tonight. A simple Fansome troll goes three pages. This has to be a record. You chose a timely topic with which to troll. Joe McCarthy didn't really mean to set off a firestorm with his "205 communists in the State Department" claim in Wheeling, either, but look where it took him. Oh, the places you'll go! The list of timely topics has gotten HUGE lately. Has anyone been watching the stock markets, eyes done told you so. Good Bye, King Kong Radio. Smashing the competition. And this is not the wrong thread. 2. China, Turkey, and several other country's stock markets are down 1/5th from only weeks ago. The emerging markets are all down by a large basis, and they were where the investors were looking to make killings. Some are saying the top has been reached in the dow/nasdaq and from now on it will be long vix. 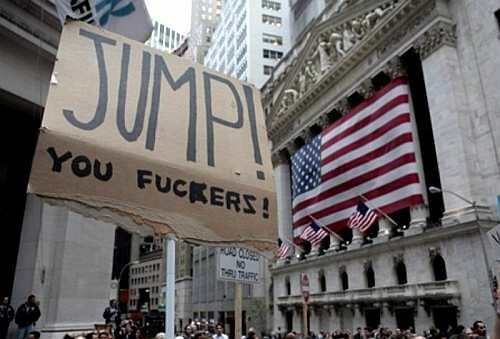 What broke the market in 2007 wasn't fixed, it was amplified while the fed kept the corpse of the global economy on life support with qe. Now the fed has bought up America, it's starting qt to the tune of over $100B a month, and at the same time increasing rates. This will make 1929 and 2007 look like good times. Instead of 1 lehman bros there will be tens of thousands. And no bail out but rather bail ins. What's a bail in I hear you thinking? That's where the bank, your bank, steals your deposit to pay off its creditors for your banks gambling losses. Your bank, in return for your stolen deposits, gives you stock in your bank, wich is likely on the edge of collapse anyway. This bail in mechanism avoids the huge amounts of time it takes to coerce congress into another round of stealing from our grandkids, by tapping directly into each taxpayer's bank. Ask your banker about how you can help them during a bail in today! Lol the Cypriots should have been paranoid. He needs to force some brains into that space between his ears.